The Asia 21 Young Leaders Summit, part of the larger Asia 21 Young Leaders Initiative, is the pre-eminent gathering of Asia’s most dynamic young leaders from every country and every sector in the Asia-Pacific region. 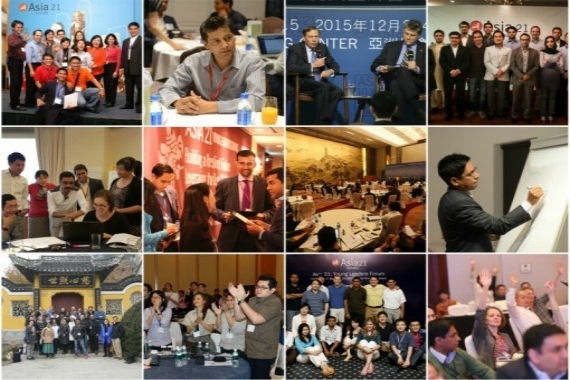 The Summit brings together a core group of over 150 Asia 21 Young Leaders Fellows and delegates from Asia and the U.S, representing a wide range of fields, and all under the age of 40. The Summit aims to prepare tomorrow’s leaders for the challenges and responsibilities of global citizenship by bringing together delegates from across the region to generate creative, cross-sectoral approaches to leadership and problem solving; to build networks of trust across geographic boundaries; and to educate each other in the highest ideals of values-based leadership. At the invitation-only, three-day Summit, young leaders have the opportunity to discuss various best practices in leadership, dichotomies in the world we live in, and what new generations may do to create new opportunities for partnerships, sustainability, and cooperation. Delegates also develop group public service projects, which they will administer through the next year. In addition to a keynote speech, breakout sessions and group discussions, the Summit features an array of lively performances, and a special blog. Last year, two of ACYD alumni were selected in the Class of 2016, and in 2017 the honor goes to Henry Makeham, the founder of ACYD. HENRY F. MAKEHAM is a U.S. mergers and acquisitions associate with Linklaters LLP qualified to practice in New York, Hong Kong, and Australia. He has extensive experience in cross-border transactions counselling Asian clients investing abroad, especially where there is a U.S. nexus. In 2010, Henry founded the Australia-China Youth Dialogue; Australia’s preeminent track two early career leaders forum with Greater China. He serves on the Panel of Advisors of the University of Sydney’s China Studies Centre and has written on Asia Pacific regionalism, ‘Chinese Perspectives on the Feasibility of an Asia Pacific Community’, published in The Chinese Journal of International Politics (Oxford University Press). He has been a participant in the Young Leadership Dialogue of the Australian American Leadership Dialogue and the Australia-China Forum (the precursor to the Australia-China High Level Dialogue). Makeham graduated with double First Class Honors degrees from the Australian National University in Law and Chinese Studies. He is a recipient of the Prime Minister’s Australia Asia Endeavor Award, and was honored as the university’s 2015 Young Alumnus of the Year. He also holds a Master of Laws from Harvard Law School where he served as Managing Editor of the Harvard Business Law Review, and was awarded a Dean’s Scholar Prize for his work in Leadership in Law Firms.